How does an indie-Americana band swing back after their third studio release was nominated for the elusive Grammy? Mirage Rock cuts out Band of Horses‘ expansive reverb and burrows into Ben Bridwell’s southern roots. It’s an album that heavily leans on traditional rock arrangements, while still showcasing Bridwell’s famous falsetto. Lacking in experimentation, instead the tightly produced songs sound like a dusted-off Graceland without the South African flair, which is more of a compliment than a slight. 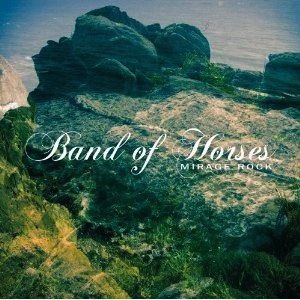 This deviance toward hometown twang will most likely create a chasm between Band of Horses’ fans. Gone are the moody moments to cinematically live inside. Instead, songs like “Slow Cruel Hands of Time” and “Long Vowels” cough out the dust bunnies and polish the cowboy boots. “Feud” is most reminiscent of their earlier work because it hits with a driving drumbeat and a swirling crescendo of hi-hats and crash cymbals. In “Heartbreak on the 101” Bridwell’s voice crackles low and raw, and the softly sweeping strings expand the moment into something more than just another sad song. bearded boys in Band of Horses seem to still be surprising themselves with their own tinkerings. The future looks promising.